Bottle Handle; Enablers, Elderly, Physically Impaired, Arthritis Sufferers. 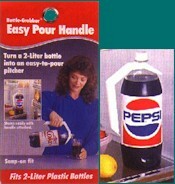 This convenient handle attaches securely to any standard sized 2 liter bottle turning it into an easy to pour pitcher. Great for kids and the elderly. Sturdy plastic for a sturdy grip. Fits easily in fridge. Makes pouring from large clumsy bottles easy for children, adults and the elderly.